When extensive bulkheading is not required, the 2.00" (50mm) thick FabLine Batten wall system provides an effective, economical partition system. Fewer components and simpler design allows the wall system to be installed even more quickly than framed wall systems or conventional construction while still maintaining a flush surface on both sides of the wall. 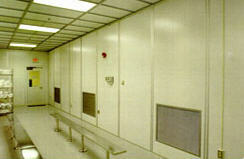 The non-progressive design allows the individual wall panels to be moved without disturbing adjacent walls or ceiling. When tool bulkheading is required, Batten 2000 wall system can easily interface with the Framed wall system to accommodate tool and equipment requirements without disturbing the aesthetics of the wall installation. Provides an air tight seal around tools and equipment. Factory installed windows provide single flush glazing and beveled backs for convenient wipe downs. Battens are aligned flush at the basetrack providing a flush connection thus eliminating ledges where particles can accumulate.